The 7th Annual Bermuda Shakespeare Schools Festival, scheduled to be held at the Earl Cameron Theatre this week is cancelled, as the students had missed too many practice times due to both Tropical Storm Fay and Hurricane Gonzalo. A spokesperson said, “We sincerely apologize for any inconvenience this will cause. 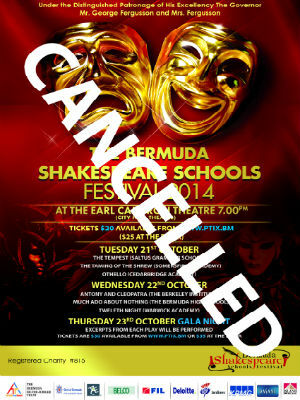 “We spoke with the teachers at each of the schools after Hurricane Gonzalo, giving them the option to continue with the festival, or have the students perform abridged versions of their plays, but it was decided that the students had missed too many practice times due to both Tropical Storm Fay and Hurricane Gonzalo, and it would be best to cancel the festival. “We certainly appreciate all the hard work the students and their instructors have put into preparing for the festival, and are truly saddened by this decision. “Those who have purchased tickets will receive a refund, please be patient as we arrange for this refund. I am so so sorry to hear this – so much work has gone into it – what a huge disappointment. This year, I had made arrangements for my wife and children to attend. We wanted to attend last year but were not unable. Is is not something that can be postponed or condensed into one night as I would imagine that some students were ready and we could have a collage of scenes.